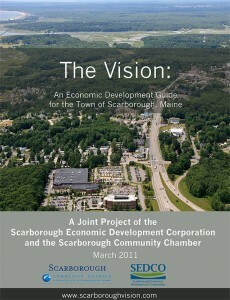 The Vision Committee, A joint project of the Scarborough Community Chamber and the Scarborough Economic Development Corporation, presents The Vision: An Economic Development Guide for the Town of Scarborough. The Vision is the culmination of more than two years of work by this committee and provides a wholistic view of economic development in the form of ten vision statements. Click on the picture below to view the current draft of The Vision. Vision Committee Meetings take place on the second Thursday of the month at Noon.